Among the many Call of Duty: Modern Warfare 2 rumors that we've sifted through in the last several months, the prospect of an optional third-person perspective has only come up once that I remember, and not in a plausible context. In the opinion of a last-gen SOCOM and Star Wars Battlefront fan, the option to swap to third-person in a Modern Warfare game would be a pretty great addition. 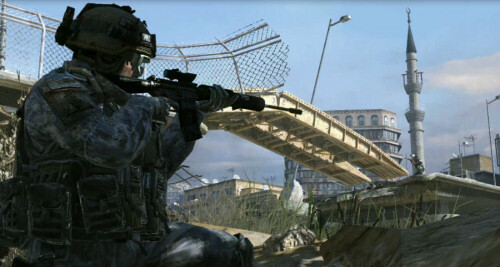 Now, it seems, a video and screenshot have surfaced that bring credibility to once-scorned rumor: Modern Warfare 2 appears to support the third-person perspective during private matches. UPDATE: Joystiq grabbed an interview snippet wherein the third-person camera was confirmed by Robert Bowling, but only for certain playlists and private matches so far. Here's hoping this option is extended to hosts of private co-op rooms as well. The below video was taken by someone who allegedly got their hands on an "early copy" of the game. Many of the comments on that video's YouTube page note the similarities between SOCOM: Confrontation and the gameplay shown. It is true that the similarities exist, but after watching, I'm convinced that the character model, animation, and the explosion effects are pure Modern Warfare, even if this turns out to be a hoax. For most Modern Warfare players, this news isn't necessarily groundbreaking; private matches are rarely used by the vast majority because XP cannot be gained. However, for those of us who would rather customize a private game with our friends than try to gain Prestige ranks, this could be a great distraction. In fact, the unsatisfied SOCOM player inside me is aching for confirmation, at which point - if true - I will promptly send a giddy email to all of my old clanmates.